How many of you have New Year’s Resolutions that you are hoping to keep? There is one you can make and keep, guaranteed. It will help you, the mountain bike community, and the trail community at large. Ready? Slow down when passing others! How many things in life can you do that actually solve a problem? 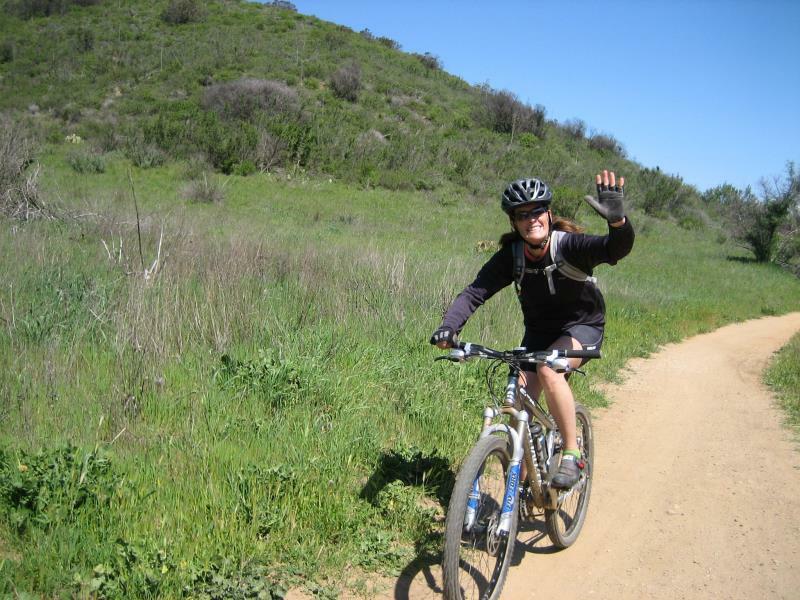 On our trails, the one justifiable complaint about mountain bikers is that they sometimes go too fast when passing others, which can be scary and upsetting,even to other cyclists. So all you have to do is slow down when passing, and you SOLVE THE PROBLEM! Multi-use trails. We can and must get along. Many sessions at the conference talked about the importance of engaging volunteers, of reaching out to foster public-private partnerships between land managers and non profit advocacy groups. CORBA has already been putting into practice many of these principles, partnering with the Forest Service and State Parks to help maintain trails; partnering with the So Cal High School League to empower the next generation of off-road cyclists as advocates and stewards. CORBA President Mark Langton participated in a rousing panel presentation on the Conejo Open Space Conservation Agency, a multi-use trail system that has worked successfully with minimal conflict for more than two decades. An entertaining keynote address was given by conservation celebrity Ed Begley Junior. He treated the attendees to stories of how and why he came to be so ingrained within the conservation movement. Among the volunteer groups in attendance, there were at least five bicycling advocacy groups represented. 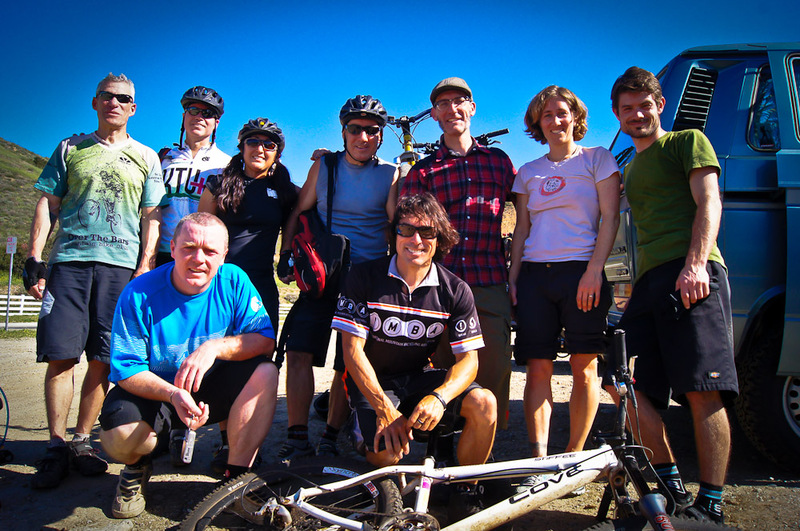 IMBA’s new regional director Patrick Kell was there, along with representatives from the San Diego Mountain Bike Association, Central Coast Concerned Mountain Bikers, Santa Barbara Trail Volunteers, CORBA, the Los Angeles County Bicycle Coalition and other groups. On Friday morning of the conference, 8 bicycle adovocates joined Steve Messer and past CORBA board member Hans Kiefer in a tour of Rocky Peak. 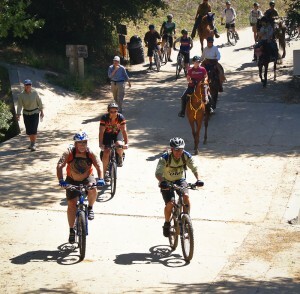 They had a great ride, showing once again that there is some great mountain biking around Los Angeles. A conference such as this is vital for bringing disparate user groups, land managers and trail stewards together, where we always learn we have much more in common than we think. The fact that working together is often the only way anything can be accomplished was one of the most important take-home messages from the conference. Our since thanks to the organizers, the presenters, the sponsors, and to all our fellow attendees at the conference. These meetings underscore the importance of working together, and create at an atmosphere conducive to constructive and informative exchanges of information and viewpoints. We look forward to next year’s Trails and Greenways conference in Lake Tahoe. In many discussions between different trail user groups, the fact often emerges that we all share many common goals and attitudes about trails. Most trail user groups want to help maintain trails for the benefit of all; they want to minimize damage to our public lands, while preserving recreational access in perpetuity. We want to protect and preserve what precious little open space remains for future generations to enjoy and recreate; we want our children and successors to be able to experience the great outdoors, learn from it, and be inspired by the wonders of nature. We want to see responsible trail use, with mutual respect for other trail users, for wildlife and nature, and for the environment. Where all these groups sometimes differ is how we choose to enjoy our public lands, and the extent or methods of the protections needed to achieve those goals. Some choose to ride mountain bikes; others prefer to hike, trail run, climb, ride horses, take OHV’s, sail, kayak, camp and and any number of other activities. We all seek the peace of the forest and to escape the city in our great mountains. While there are differences, the common grounds are what should bring us together. This is nowhere more evident than in the Angeles National Forest, where trails (outside of wilderness areas) are all multi-use. The Forest Service’s multi-use policy fosters cooperation and where needed, compromise between these groups. Every other month volunteers from the LA River Ranger District of the Angeles National Forest gets together with forest officials to be updated on what’s happening in the forest, what each group is working on. We share information and first-hand reports of our accomplishments, our upcoming projects and our observations with each other and Forest Service officials. It’s a great way to coordinate activities, and set up collaborations that further our common goals. Similar meetings take place in other districts in this, and other National Forests. The various volunteers groups are each passionate about what they do, whether it is acting as campground hosts, patrolling trails, doing trailwork, protecting and documenting forest history, restoring habitat, removing invasive plants, or just disseminating information and respect for the forest among their members and supporters. Each month intrepid volunteer Guy Kuhn puts together the volunteer newsletter, a summary of the reports and interactions from each of the meetings and gleaned from the web sites of each volunteer group. 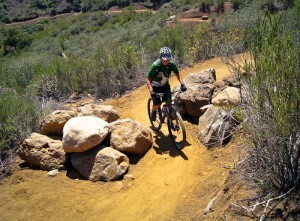 CORBA reports on our trailwork projects, completed and upcoming, along with fellow IMBA chapter Mount Wilson Bicycling Association. Forest officials give us the inside information on what’s happening in the forest, and what we can expect in the coming months. We learn the fiscal and other challenges faced by the forest, and look for ways to contribute. The multi-use policy and resulting cooperation between user groups is a win-win for everyone involved. The Forest would be hard-pressed to function without its volunteers. 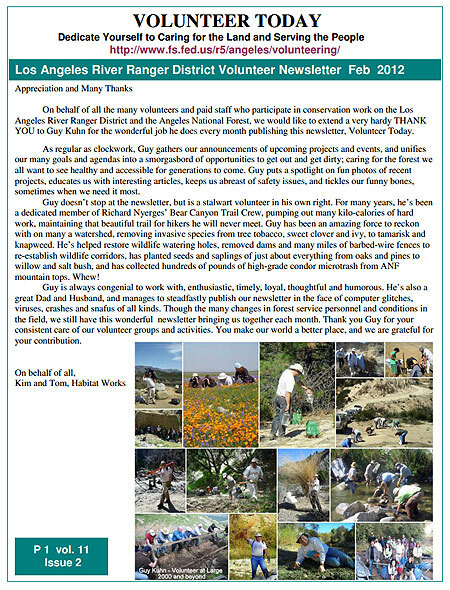 If you’d like to learn more read the latest volunteer newsletter featuring reports on trailwork projects from CORBA, MWBA, San Gabriel Mountains Trailbuilders, Mounted Patrol (equestrian), Angeles Mountain Bike Patrol, Sierra Club, Boy Scouts, Forest Lookout association and other groups. Since the trail re-opened in May this year, El Prieto has seen heavy use by cyclists eager to get back to the trails they love. 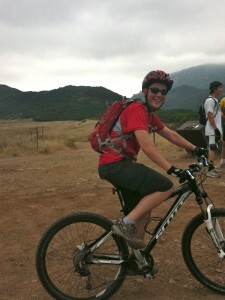 Recently there have been a few complaints from hikers being startled by bicycles on El Prieto. CORBA donated to the Forest Service a set of IMBA multi-use trail guideline signs to be installed on El Prieto. 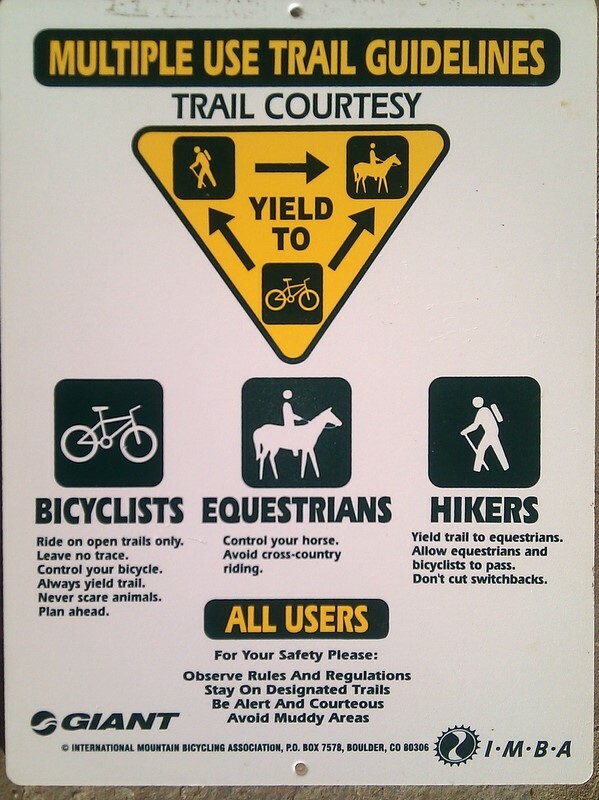 Signs are needed to help inform and remind cyclists to be aware of other trail users and slow down and yield to hikers and equestrians. 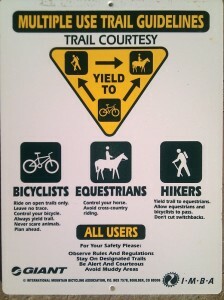 If cyclists want respect on the trails, we have to give respect to other trail users. IMBA’s “Rules of the Trail” are the standard to which we need to hold ourselves and our fellow riders. Banner Moffat of the Friends of El Prieto and Steve Messer from CORBA spent Thursday afternoon, August 25, carrying in the signs, posts and tools. They installed the first sign near the picnic bench mid-trail that afternoon. 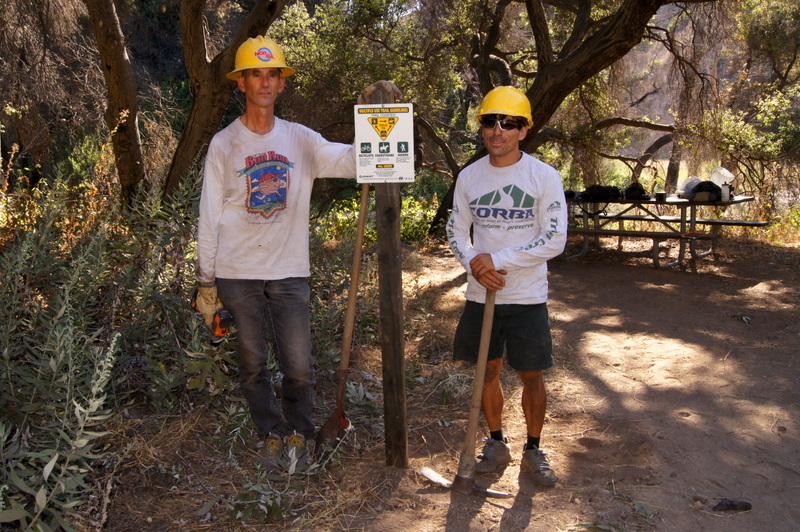 The remaining signs at the top and bottom of the trail were installed by Banner and volunteer Ben Bertiger the following day. 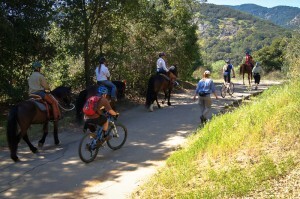 All of the trails open to bicycles in Southern California are multi-use, and hikers or equestrians love the trails as much as we do. We urge riders to be respectful of other trail users, to help ensure that these trails remain multi-use, and to strengthen our case to open new trails to bicycles. State Parks has announced that the multi-use Tapia Spur Trail in Malibu Creek State Park/Tapia Park will undergo several changes to address the trail’s ability to sustain shared use by hikers, equestrians, and mountain bikers. The work is tentatively set to begin in September of 2011. According to State Parks’ Tapia Spur Trail project description (Tapia Spur Trail Muli-Use Work Project Report – PDF), dated April 12, 2011, Tapia Spur Trail lacks a variety of components necessary to adequately accommodate multi-use moving forward based on new multi-use guidelines, and therefore intends to implement several multi-use components that will bring the trail up to current multi-use guidelines. These components include brushing (which has already begun), improved drainage and increased tread width, speed control sections in areas lacking sight distance, and realignment of one stretch of trail to increase sight distance and redirect the trail off the fall line. Of particular interest to CORBA are the components of “sinuosity” (the trail weaving in and out of the topography to create a curvy alignment) and “pinch points” (placement of items such as rocks or logs that create a perceived narrow point in the trail corridor). 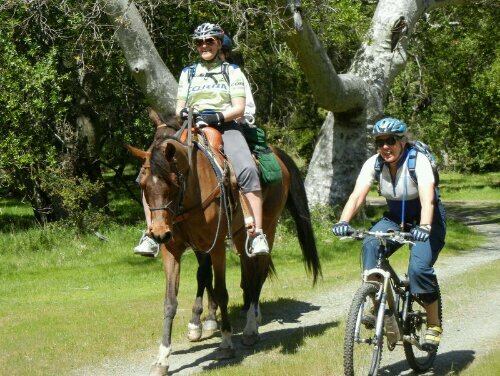 Both of these components have been used in other areas with good results; that of slowing the mountain biker while maintaining an enjoyable experience for the cyclist, hiker, and equestrian. As I have previously stated, slowing down around other trail users can virtually eliminate the complaints by those who say that mountain bikes are dangerous because they go too fast. 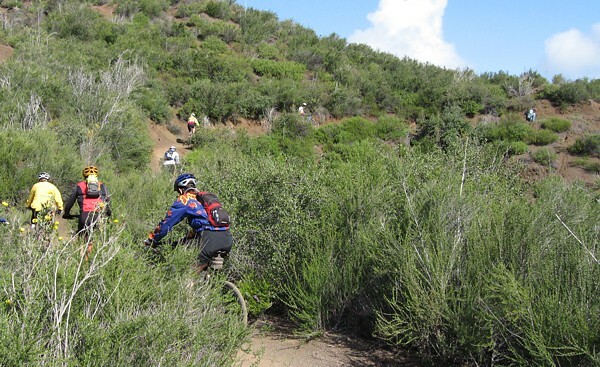 While most cyclists are in control of their bikes when passing other trail users, the perception of speed–even a few miles per hour–can reduce or even spoil another user’s trail experience, including other mountain bikers. We’re all out there for the same reason, to enjoy nature. Treating others with respect is part of that enjoyment. CORBA is encouraged by this upgrade project as it will allow State Parks to work more closely with the trail user community in implementing shared use concepts and guidelines. Tapia Spur Trail can become a showcase of proper multi-use practices, and with the assistance and cooperation of the mountain bike community, we can potentially have a comprehensive example of multi-use guideline implementation. 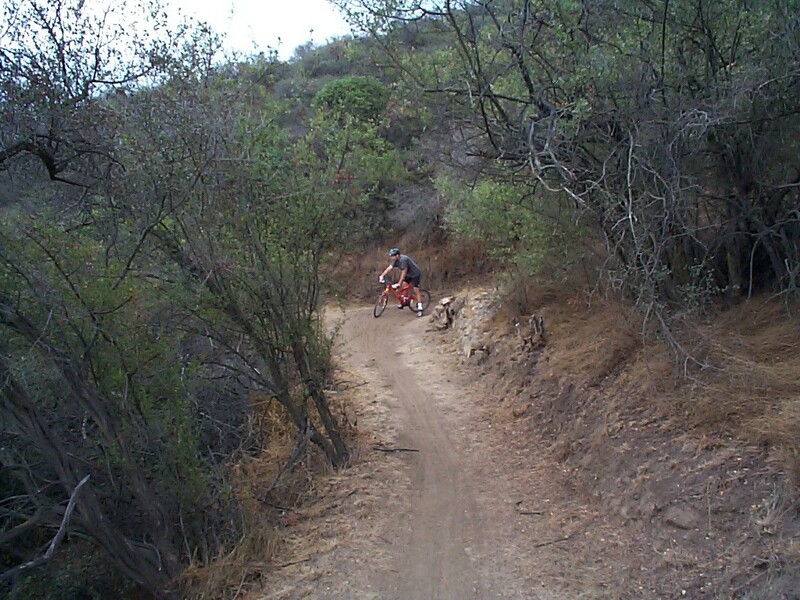 CORBA has been assured that mountain bikers will be considered in every step of component implementation on this important trail link from Malibu Creek State Park to Tapia Park. I’d like to take this opportunity to remind the mountain bike community that CORBA’s funding and volunteer needs are ongoing. Trail work volunteers are still needed, as well as funding for CORBA Trail Crew tools and other supplies. 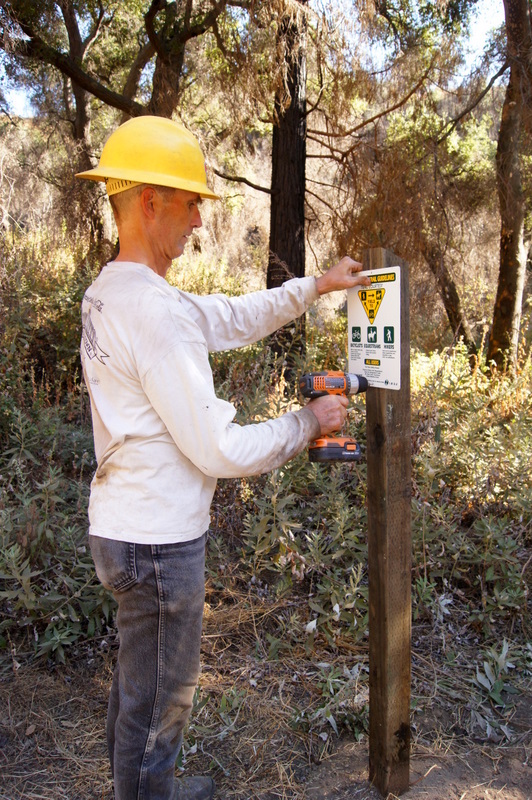 Just recently State Parks released a comprehensive trail crew leader training schedule, and in addition to trail workers, we also need those interested in becoming trained and certified as trail crew leaders. Training starts July 7 so we need volunteers immediately. To contact CORBA, email advocacy@corbamtb.com, and go to our Join/Donate page to to help support CORBA’s efforts. 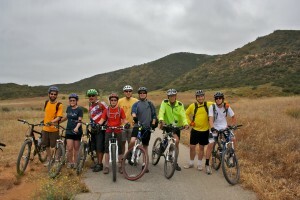 Nine mountain bikers turned up for CORBA’s Beginner Ride in Sycamore Canyon (Rancho Sierra Vista/Point Mugu State Park). 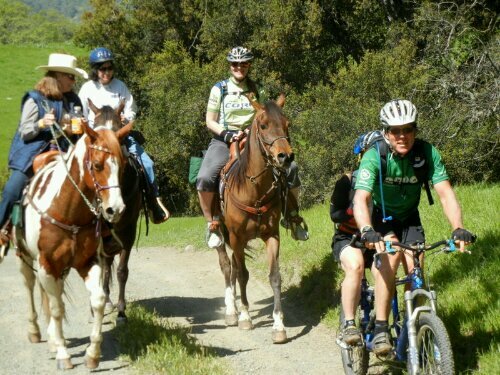 We started our ride on nice double track leading through the meadows of the National Park Service property of Rancho Sierra Vista. Once at the top of famous Blacktop Hill we took a moment to talk about safety of descending the hill: Watch ahead for gravel on the corners, control speed (max 15 mph), slow down for other trail users, perhaps say “Hello” and last but not least… have fun! Once down the hill we turned west onto Ranch Center Road, unfortunately passing by the fun side route known as Art’s Trail, which was closed a year ago due to archeological concerns (read here about Art’s trail). After some climbing on the paved road … our reward. Wood Canyon fire road and two great single tracks, Two Foxes and Sin Nombre. I think I speak for all of us when I say we had a great time! No one even complained that we had to finish our ride with a final climb back up Blacktop to Rancho Sierra Vista. Not only that, they smiled! Just check out the picture. 14 miles, 1300 feet of climbing, all smiles! 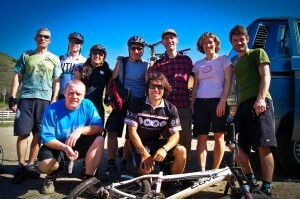 The 14-mile ride took us about three hours and had 1,300 feet of climbing, and by all accounts was pure fun! I would like to thank everyone for joining the CORBA/North Ranch Mountain Bikers Beginner Ride. Check out the pictures. Hope to see you on my next ride! Visit CORBA calendar and see you on the trails! Opponents to bicycles on singletrack trails give plenty of reasons why they feel bikes shouldn’t be there. And there is one that is actually legitimate; bicyclists sometimes go too fast, and some trail users feel their safety is threatened. It’s a simple fix; slow down when you see other trail users, or if you suspect there may be trail users in close proximity. Ideally, slow to their speed and make the encounter a pleasant one–like you’re passing a friend. If you do this, opponents will have nothing to complain about and might even enjoy the encounter! Danusa Bennett-Taber, Jim Hasenaur, and Steve Messer contributed to this article.